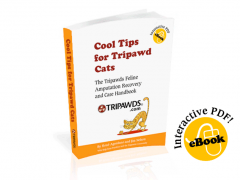 Members often ask how they can help get the word out about the Tripawds community. Now you can help others facing difficult decisions about cancer or amputation for their dogs find the support they need here. 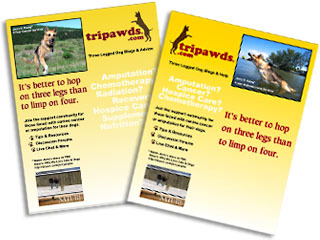 Ask your veterinarian, oncologist, or animal rehab therapist if they would display a Tripawds flier and cards. If so, download and print this insert designed to fit a counter-top card holder. These 8 1/2 x 11 business card displays can be found at most office supply stores. You can then contact us to request a supply of informational business cards to place in the display. 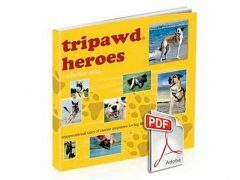 People with dogs facing amputation can then get an overview of the support tripawds.com has to offer and take a card with links to our helpful resources and forums. If the office runs out of cards, simply ask us for more or print out some more Tripawds cards yourself. If there is a bulletin board at your favorite dog park or pet store, print the fliers and pin them up with cards attached in the empty space. Or, provide your own information when planning a local Tripawd Party! Thank you for helping us help others. NOTE: 3MB PDF is optimized for output on high quality laser printer, cardstock recommended. Two designs included. Blank space provided accommodates business cards when used with acrylic counter display, or pinned to bulletin board.